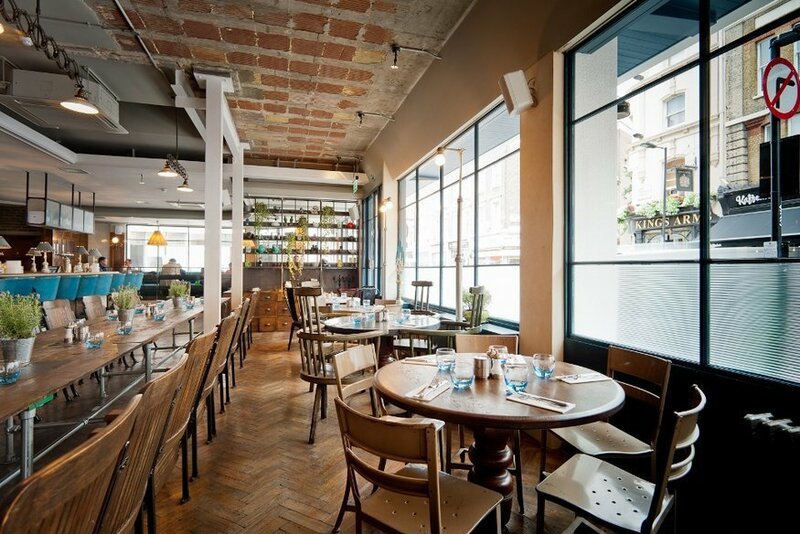 The Riding House Cafe in Fitzrovia is a favourite morning spot of ours — the breakfast here is excellent. This time though, we're trying the dinner menu, which changes seasonally. We kick off with a few dips. The most eye-catching is the whipped feta with burnt peach and cucumber jelly. It's three very distinct textures but there's a noticeable lack of flavour across all three of them. By contrast the simpler artichoke dip is served warm. This hearty choice is as comforting as snuggling up to a hot water bottle on a winter evening. A selection of some of the dishes we sampled. The goat's curd is presented beautifully in onion petals but again, it lacks distinctive flavours. A similar story exists with the lovely crisp soft shell crab — we were excited about the accompanying jalapeño mayo, but are disappointed that there's no fiery kick. The watermelon gazpacho thankfully does have a kick but it can't be teased out by dipping the bread that comes with it. However, get a spoonful of the gazpacho alone, and there's the heat we've been looking for. The cauliflower steak was a highlight. Mac'n' cheese is very en vogue right now and this place has its own spin on it with crispy shallot rings adding a satisfying crunch to the surface. We're also fans of the use of mini macaroni so it feels a little lighter. The downside is that once we're spooning out the heart of the dish, the cheese sauce itself is rather bland and it can't compete with the surface. 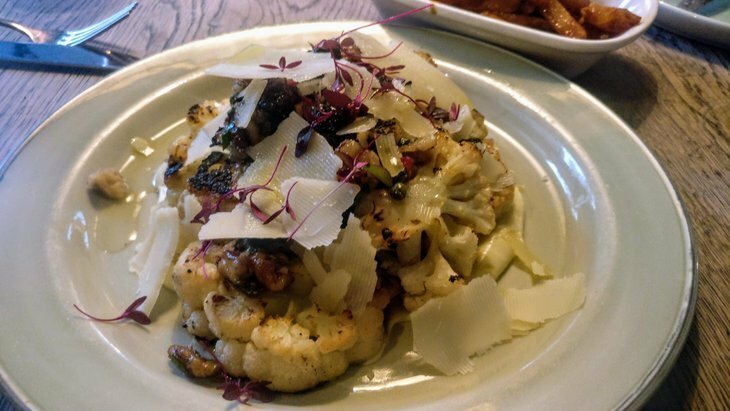 The poutine (chips with gravy and curds) is a filling take on the usual chips, and the chargrilled cauliflower steak scores highly on texture, the walnuts served with it giving extra substance. Apple tarte tatin is a tasty way to round off a meal that's been pleasant, with very hit and miss individual dishes. Riding House Cafe, 43-51 Riding House Street, W1W 7PQ. 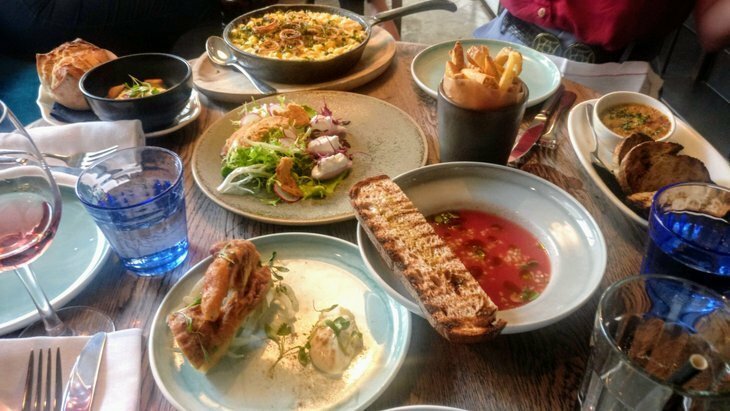 The meal in this review would cost circa £70 for two people, excluding drinks.